Having met Janice Wong when she launched an ice cream brand in Chennai during which she made some fabulous dessert creations, I've been meaning to try out her restaurant since then. Her stint at Masterchef Australia more than boosted her image to the general public, who aren't tracking who Asia's best pasty chef twice, is! Having made reservations and trying to get the cabbie to understand the address, he finally said that he will drop me off at Holland Village and I should find my way from there. No one seemed to know where this place is located and after a lady said that the thinks it is down the road, I consulted Dr. Google and he took me close. The place is on a dead end in Holland Village on the first floor with very little branding. I guess people just know the place and only first timers are going to find it difficult. The place was packed on a Wed evening, so do make those reservations! Both of us voted for the Shades of Green and after debating between Cassis Plum and Purple Chestnut, we went for the Purple Chetnut. The Shades of Green was a lovely dessert with a lovely pistachio sponge that was fluffy, a cocoa mousse and a fantastic pandan ice cream. The Pandan ice cream was probably the best thing I had in Singapore. 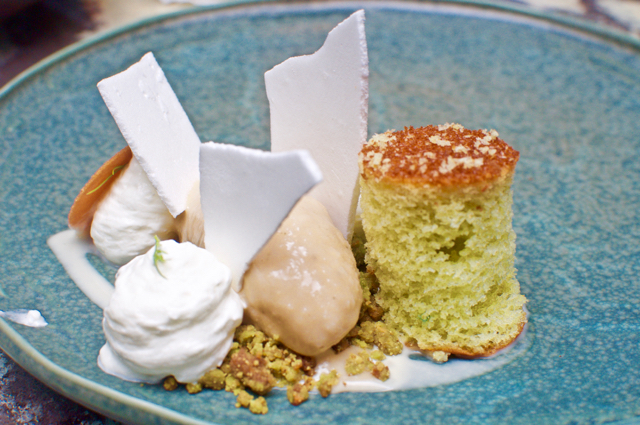 The flavours of pandan screaming through the ice cream, which played perfect folly to the fluffy pistachio sponge along with the bits and pieces of crisps that added the crunch element making this a near perfect dessert! The second one, the Purple Chestnut was a miss for us for the only reason that the red pepper raspberry gel was a little too citrusy for our liking. 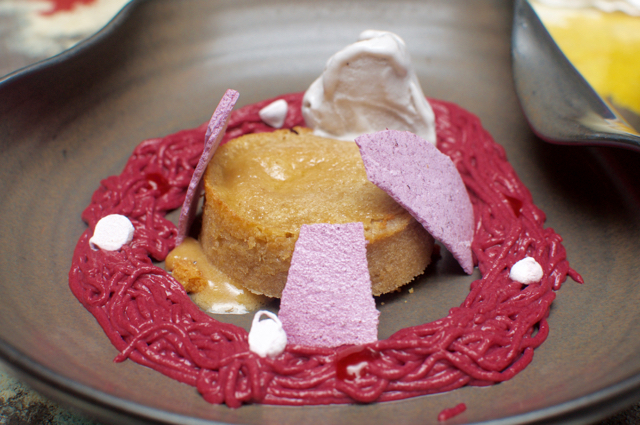 The warm fondant with the creme on the side, the lavender marshmallows and the lavender ice cream were all great, but the one thing that was supposed to tie the whole thing together, the gel, ended up overpowering the dish. On retrospect, we should have ordered the Cassis Plum! Service was brilliant, super attentive and very helpful. Edrea, our host even got her colleague to help us take the stroller up a flight of stairs and then cross the road to get our taxi. Both desserts were priced at SGD 24 and our final bill was about $51 including all taxes and service. For me, it was one more off the bucket list.